The Art students focused on details of flowers. They took photos of flowers, and then used their cameras to zoom on any details which interested them. These images were then reproduced as drawings. These drawings can be viewed in the first slideshow. 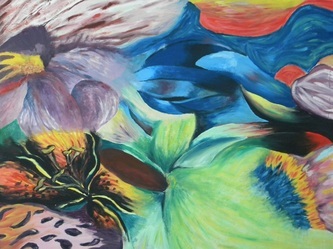 The main idea was to use Georgia O'Keeffe's perspective of stopping, looking, observing and creating what is tiny into a beautiful work of art which will make people stop and take time to admire. 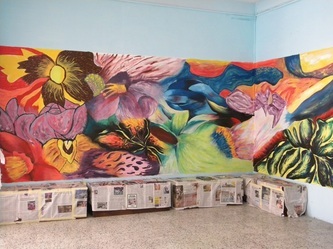 These drawings were then used to create a collage, which would eventually be used to create a large mural at Girls' Secondary School, St. Theresa College. The following slideshow shows the various collages created. 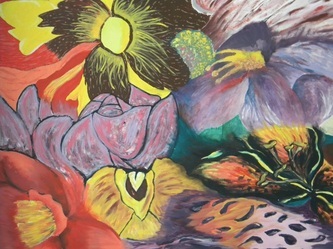 Eventually, one of the collages was chosen as basis for the drawing of the wall mural. Its outline was drawn on the wall as shown in the following slideshow. Once the outline was ready, the students started colouring the wall mural. The final result was an impressive one. 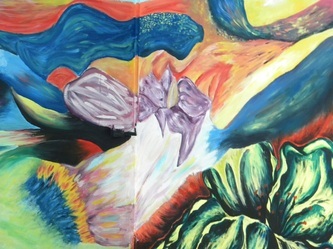 The following video shows the sequence of events that led to the completion of the wall mural.